Children and adults often find it fun to learn how to write a concrete poem. Developed in the 1950s, concrete poems are also called visual, shape or pattern poems. The poet chooses and arranges words to form a picture. The results are often beautiful, intriguing word pictures. Concrete or shape poetry emerged in the 1950s as an offshoot of a minor school of painting, called the Concrete Painting style, which developed in the 1940s in Europe. Famous poets who explored this style include Ezra Pound, Lewis Carrol, George Herbert and several others. While concrete poetry is similar in some ways to free verse poetry, the emphasis on form sets it apart from other styles. In a concrete poem, the poem's shape depends upon the subject of the verse. If you remove the form or shape from the poem, it weakens the poem. The picture or shape created by the words and verses is inexorably intertwined with the meaning of the poem. The most popular shapes are hearts, crosses, and angel wings. Geometric shapes are also popular. Creating a concrete poem takes a bit of time and skill to write both a wonderful poem and arrange the words into pleasing shapes that represent the poem. If you'd like to try your hand at a concrete poem, you may want to download this document which demonstrates the steps to write a concrete poem. It also provides examples of different shapes. 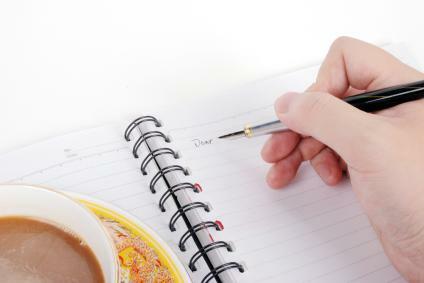 Choose an object in the room in which you're writing. It may be a picture, a vase, the television set, or a computer. This can be the topic of your poem. Consider the object. Brainstorm a list of words and phrases that describe the object, and anything else that comes to mind when considering the object you've selected as the subject of the poem. Creative_Writing_Prompts may also be helpful to get the creative juices flowing. List any special significance, events, or elements of the object. Does the object remind you of someone or perhaps special time in your life? A vase of flowers, for example, may remind you of your grandmother's garden or your mother's prized roses. List any associations that come to mind. Now take a blank sheet of paper. Sketch an outline or image of the object. Begin fitting the words and verses into the outline you've sketched. They shouldn't feel contrived, but rather flow as poetry. When your poem says what you wish it to say, you may wish to go back and erase the sketch so that the words themselves stand out on the paper in their new visual form. You can also look for a free online writing class to help you learn how to write concrete poems and other poetry styles. Poetry teachers recommend that novices keep in mind the following suggestions when writing their first concrete poems. If the shape is removed from the poem, the poem loses significant meaning. In fact, you can't remove either the shape or the words. Always remember that in a concrete poem the two have to work hand in hand. The shape of the poem itself fills in the gaps in the reader's mind. You can make leaps in syntax and logic in the poem if the shape provides the missing details to the reader. Don't forget that the white space surrounding the poem can also speak volumes. Can you play with the shape of the poem so that the white space itself adds to the meaning? Garden Digest provides an index of concrete poems published to the Internet. There are plenty of examples to help writers get the hang of this unique art form. Poetry4Kids offers a simple explanation and examples suitable for children who might want to try this style of poetry.